November 29, 2009  Los Angeles Times reporter Mike Penner, who publicly chronicled his gender transition and returned to the paper under the name Christine Daniels, died Friday evening at age 52. November 24, 2009  A federal law that would offer protection to journalists who refuse to reveal their sources is before the Senate Judiciary Committee. Toni Locy, a former USA Today reporter once held in contempt for not revealing her sources, assesses the proposed shield law. November 23, 2009  One of the most popular programs on Iraqi TV these days is Hotline, a call-in show that allows viewers to take their problems directly to the highest government officials. It offers an unprecedented chance for ordinary Iraqis to confront their government. 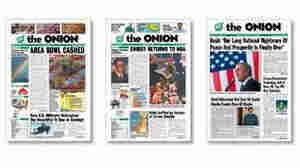 November 20, 2009  America's Finest News Source has released a book celebrating its 21 years of satire (with a wink). Onion editors Joe Randazzo and Joe Garden talk with Renee Montagne about the serious business of being funny. Also: See the fun The Onion has had at NPR's expense. November 19, 2009  The Washington Blade — widely regarded as the newspaper of record by members of the gay community — surprised readers when it abruptly folded its operation Monday. For 40 years, the paper covered the highs, lows and tragedies of gay life. But while blogger Zack Rosen says the Blade's demise is unfortunate, he says it's not the end of the world. Rosen is a former writer for the newspaper and now runs the Web site TheNewGay.net. November 17, 2009  The Washington Blade, an influential newspaper that serves Washington, D.C.'s gay community, was shut down Monday when its owner, Window Media LLC, ceased operations. The paper's editor, Kevin Naff, says the staff has met and laid out plans for a new publication. November 16, 2009  The president uses a town hall-style meeting with university students in Shanghai to focus on human rights, one of the trickiest issues separating China's communist government and the United States. Later, President Obama met with Chinese President Hu Jintao in Beijing. November 16, 2009  Former vice presidential candidate Sarah Palin launches a media tour Monday to promote her memoir, Going Rogue. What will the book — and book tour — mean for Palin's political future?